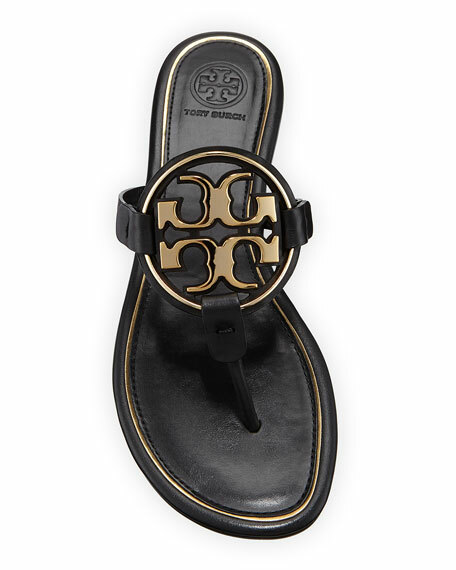 Tory Burch "Miller" leather sandal with cutout logo medallion. EXCLUSIVELY AT NEIMAN MARCUS (Gray only) Giuseppe Zanotti patent leather sandal with Swarovski® crystal-beaded suede lip appliqués. 0.3" flat stacked heel. Three-band upper. Slide style. Leather lining and sole. Made in Italy. Rag & Bone "Arc" sandal in smooth leather, embellished with ball-stud tab and ring. Wide-cut, one-band upper. 0.4" flat heel. Rag & Bone "Arc" sandal in smooth leather, embellished with ball-stud tab and ring. Wide-cut, one-band upper. 0.4" flat heel. Pin-studded welt detail. Slide style. Imported.